Vasily Ivanovich Surikov(12 (24) January 1848, Krasnoyarsk - 6 (19) March 1916, Moscow) - Russian artist, master of historical painting. Pictures of Vasily Surikov revived the world of bygone eras of Russian history. Surikov's mastery as a subtle colorist and artist who perfectly mastered the composition (the friends even called him “the composer”) made him one of the main figures of Russian painting. For more than 25 years he was a member of the Association of Traveling Exhibitions. Features of the artist Vasily Surikov: polyphonic, always carefully verified composition; virtuoso ability to write a crowd of people, with each character is individual; subtle sense of color and well-thought colors of the paintings; appeal to Russian history, the re-creation of historical situations. Famous paintings by Vasily Surikov: "Morning Strelets penalty", "Boyaryna Morozova", "Menshikov in Berezov", "Taking the snow town". Vasily Surikov could say no. He refused a pensioner's trip at the expense of the Academy of Fine Arts in Europe (although not offered to him immediately after graduation, but six months later), preferring to engage in painting the Cathedral of Christ the Savior. Europe has not gotten away from him, but at first Surikov wanted to gain financial independence (it started with the fact that Pavel Tretyakov bought Vasily Surikov's “Morning of the Strelts Execution” for 8,000, a lot of money for those times). Three times he refused to teach at the Academy of Arts and the Moscow School of Painting, Architecture and Sculpture. And there is a story that a member of the party “to talk about death” with his dying wife Leo Tolstoy Surikov let him down the stairs. Vasily Surikov was born in Krasnoyarsk and throughout his life he was extremely proud of his belonging to ancient Cossack clans. After the death of the father, the family was in a constrained financial situation. Yenisei Governor Pavel Zamyatin and the Siberian gold producer Peter Kuznetsov took an active part in his further education. 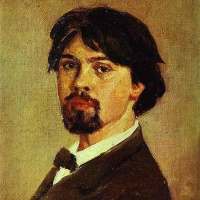 Kuznetsov appreciated the paintings of Vasily Surikov and took over all the costs of training and living in St. Petersburg. Then everything developed rapidly: the Society for the Encouragement of Arts, the Academy, medals won by the artist’s paintings; Surikov is a contender for the Grand Gold Medal, but does not receive it, and after that he himself refuses to take a pensioner's trip. The first great work of the artist Surikov at the end of the training was not a painting, but frescoes in the Cathedral of Christ the Savior. This allowed him to find his place in a geographical sense - Surikov remained in Moscow, this city was really close to him, the most famous paintings of the artist were written here. Here he found his only love: his wife, Elizabeth Chare, bore him two daughters (the eldest later married an artist Petr Konchalovsky). His wife’s premature death became a real tragedy for Surikov, he didn’t take a brush for two years, and only on a trip to his native Krasnoyarsk presented her lost inspiration: Vasily Surikov’s painting “Taking a Snowy Town” is like a photo of his own carefree childhood. Returning to Moscow, Surikov began to travel a lot, continued to work actively and did not even have time to embody all the ideas. He was buried at the Vagankovskoye cemetery next to his wife. On the Arthiv portal you can see reproductions (photos) of Vasily Surikov's paintings in high resolution.